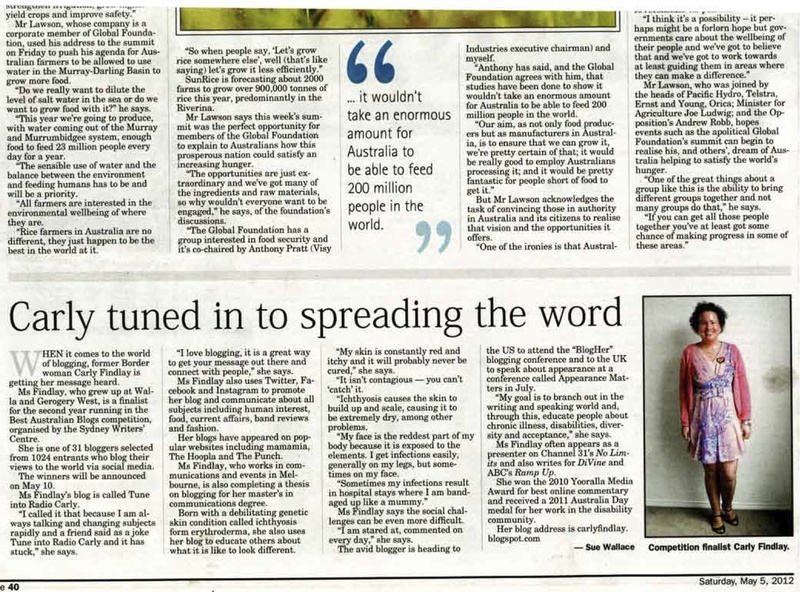 Tune into Radio Carly: Language really does matter when reporting about people living with Ichthyosis. Harper's real story. Language really does matter when reporting about people living with Ichthyosis. Harper's real story. This article from Stock News USA came up in my google alerts yesterday morning. You can read the full text here. 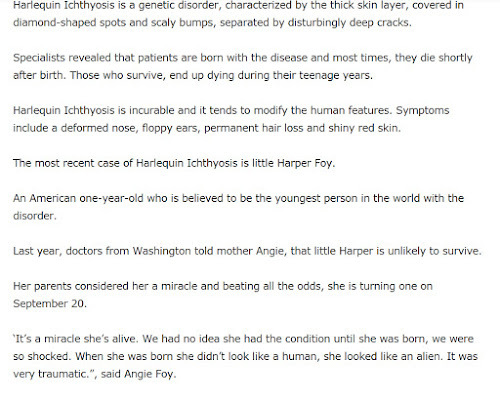 "Suffering from horrible harlequin Ichthyosis." 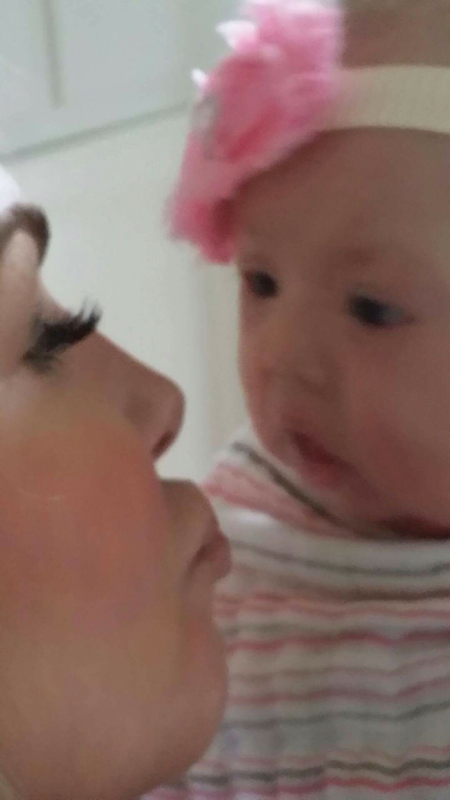 "When she was born, she looked like an alien. It was very traumatic"
Those three excerpts is all I took from the article, and I am someone with Ichthyosis. 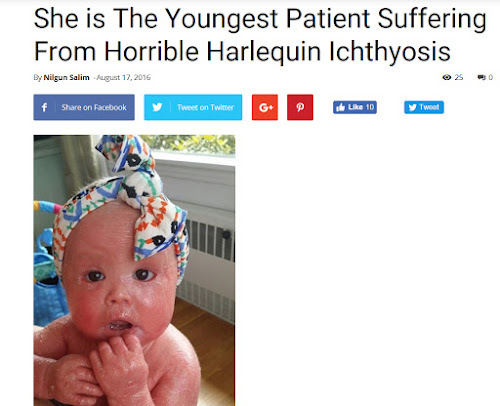 The language used in this article about a beautiful baby with Harlequin Ichthyosis is so othering, pitying, sensationalised and disempowering it's no wonder some people with the condition question their self worth, and people without the condition are shocked by it. I was so saddened at this language to describe one of my people that I didn't take away that she is loved, that she is oh-so-cute and that she will most likely have a good life with the right medical care and emotional support. What are readers who *aren't* affected by Ichthyosis getting from the story? Awareness raising through tabloid media. Stripping dignity from people with Ichthyosis every day. I asked Harper's mum Angie and grandmother Charlotte what they thought of the news story, and what they'd like the world to know about Harper, given the reporter missed so many details about Harper's personality and beauty. "I thought the article, except for a few mistakes, was pretty true on. 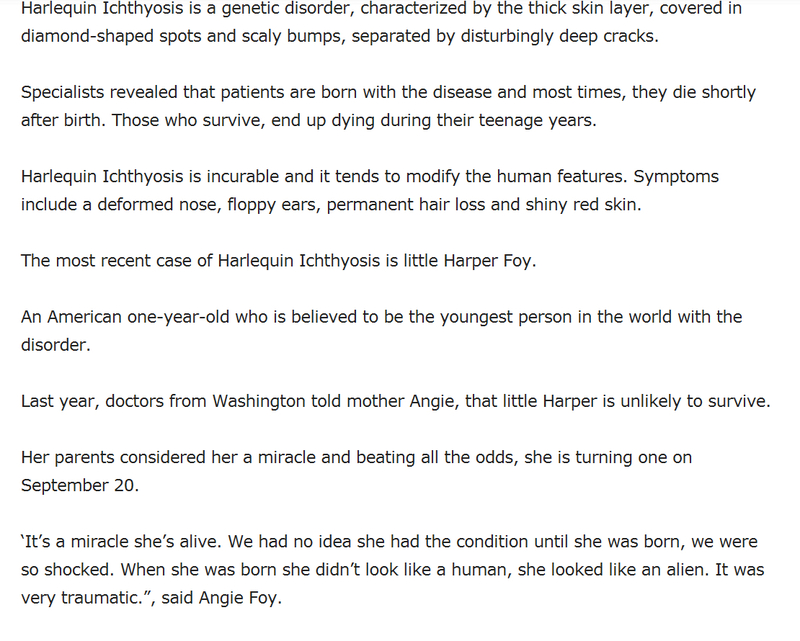 I wish they had elaborated more on what is Ichthyosis, what causes it and that there is NOT a cure. I want people to understand that this condition is not "contagious", that these children (and adults) can have full lives. They are not a "freak" show, they are humans with real feelings; real challenges; real needs, just like everyone else! I realize that Harper will look "different" but that "different" makes her UNIQUE. She is a beautiful, loving child who will grow up surrounded by love. She will go to school and learn just like every other child. I think that but getting the correct information out, people LEARN about the condition and the challenges. I know, for my own self, I have been forever changed because of Harper. This change is a GOOD thing! People are curious when someone looks different and that is why educating people is so darn important!" 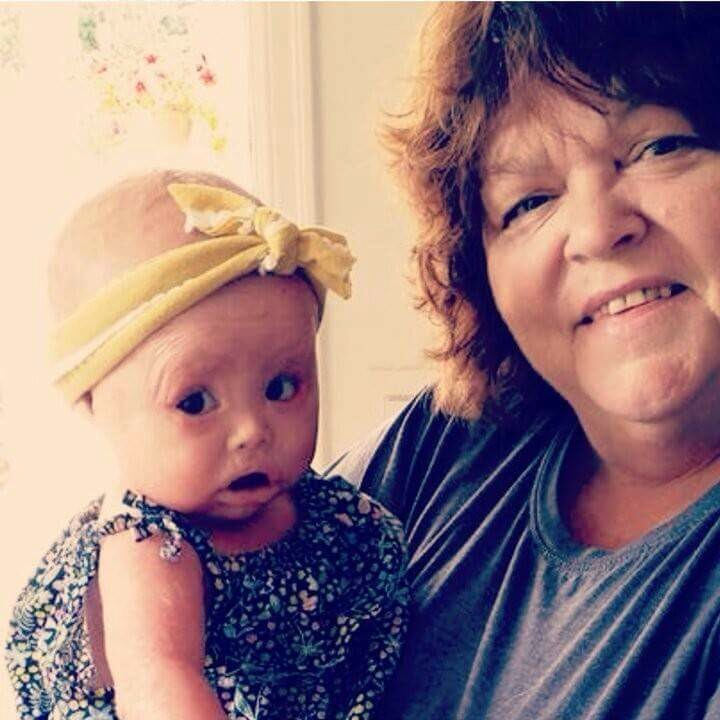 "I think Harper is simply adorable and when she smiles at you, it warms your heart! I walked in the house the other day to pick up the two older children to take them to the movies, and Harper was sitting in her highchair munching out on banana. She saw me, smiled and then growled at me. I growled back and she got this smile on her face and giggled. It was so cute! She just melts me!" 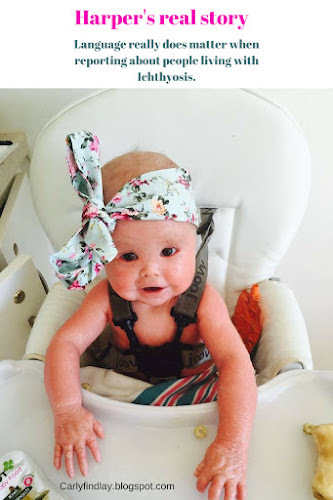 "Harper loves eating, her new favorite are bananas that she feeds to herself. She loves when you sing & dance with her. She is the biggest Mama's girl ever. She will be dead asleep and hear my voice and wake up and start kicking & squealing like crazy. I ❤️ it!! If she had it her way, I would just carry her all day. She's trying to talk and ends up growling. Lol. She loves playing with her sister, Sam who is 17 & brother Jaxon who is 6. She loves cuddling with her Daddy at nighttime. Harper also just learned to shake her head no, it's so cute. She brings so much joy to our family and we are so blessed by her beautiful soul." There's a gofundme to raise money to buy Harper a Microsilk tub. Click here to donate or share. I was disappointed to read yet another sensationalist article about a child with Ichthyosis. But I'm very glad to get to know more about little Harper through those who love her. I really do wish the media would focus on showing people with rare medical conditions in a more positive, holistic and less pitying light. We are not here for clickbait, exploitation and sensation. Courtney Westlake wrote a brilliant piece about the gawkers that Brenna encounters this week, and I think her response to "Look at her" applies to this article about Harper too. Just look at how beautiful she is and what a wonderful life she has ahead of her. And look at how those who love her have written about her. 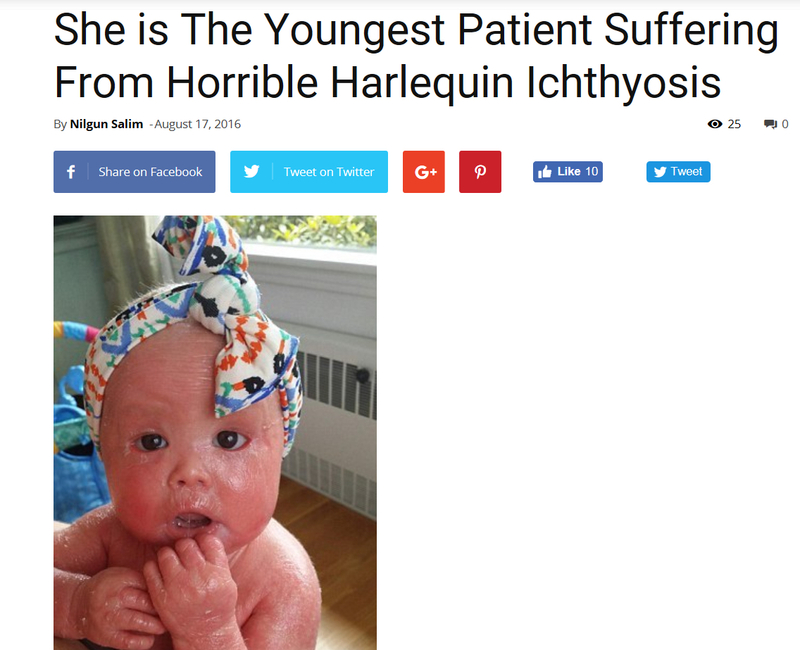 There's optimism and appreciation and a real sense that she's a whole person, not "horrible Harlequin Ichthyosis". Her mum and grandmother's words will make a stranger more 'comfortable' about this rare, often confronting condition than the tabloid article I've pictured above ever will. Language really does matter when reporting about people living with Ichthyosis. Here are some things to consider if the media asks for your story about living with Ichthyosis. Here is People with Disability Australia's guide to reporting on disability. Thanks for telling the real story. She's a cutie, you can see the character in her face. She's not her condition and I thank you Carly for helping other people learn about these issues. I see one of the cutest babies ever! Her eyes! She's beautiful. Thank you for your article addressing the original one- the language was appalling. The Itchyosis Community is a Better place for your Presence. She's precious & looks amazing! Keep up the good work Carly! This baby is so gorgeous. How can people write such trash? How can people do this to anyone let alone a baby?? It just goes to show how ableism doesn't see people with disabilities as real people. I'm glad you wrote this Carly! Your are truly amazing! Harper is so lucky to have such amazing role models to look up to. Sending you oodles of ❤️. Some of the language is quite shocking. Harper is a beautiful little girl. I hope she never reads that article and sees her mother's words. It's terrible that anyone should suffer these illnesses (the constant pain alone must be horrendous), but then to endure the indignation and disrespect of people gawking or writing such negative stuff about their appearance. Just awful. Dear World, let's stop being. Stupid, insensitive and cruel. Is this the sort of treatment she is going to encounter for the rest of her life? I hope not, but sadly it probably is. Is there genetic testing or prenatal screening available for this condition? The condition can be picked up in pre natal testing, but in many instances, parents don't know their child has it until they are born, and parents don't know they carry the gene until then. So they don't know to test for it. The most commons genetic birth defects. Even in all the ulta sounds she looked normal, nothing alarming.